Scamarcio took a cigarette out of his pocket and lit up, breathing out into the cool air and then sucking it back in. After a few seconds, he said: “God's Banker”. Rome: Detective Leone Scamarcio is on the Ponte Sant' Angelo as the CSI team haul the dead man back over its parapet, a rope still around his neck. His expensive suit bears a “Saks 5th Avenue” label, the trouser pockets are full of rubble. Something stirs in Scamarcio's memory: Roberto Calvi of the Banco Ambrosiano, “God's Banker”, found hanging, in 1982, under Blackfriars Bridge in London. His pockets too had been full of rubble. It had been a sensational case riddled with accusations of money laundering, fraud and Mafia vengeance. There had also been rumours of Vatican and right wing Masonic involvement but the connection to today's dead body is tenuous. At police headquarters Scamarcio sends his U.S. contacts a photo, asking for a possible identification. Shortly afterwards, his boss calls him into his office to tell him that there are rumours of a death amongst the Vatican high-ups. When two visitors are announced – dark suits, aviator glasses, military haircuts – Scamarcio decides they are secret service but not Italian and indeed they demand to speak in English and their accents are American. Refusing to name their department, they claim the dead man is a suspected fraudster who, knowing they were hot on his trail, had killed himself and that is all there is to it. But their patronising tone and vaguely threatening manner in assuring Scamarcio that there is no need to pursue the investigation further and that they will supply all the necessary paperwork to clear it with the Italian authorities, puts Scamarcio on his guard. That evening, determined to track down the pair's identity, he contacts an American journalist friend who specialises in the American security services. In the midst of their phone conversation Scamarcio spots a TV bulletin reporting the murder of Cardinal Abbiati. A prominent figure in Opus Dei, his apartment is in the same building as the headquarters of the Vatican Bank but Scamarcio knows that the Rome police will not be allowed into this particular investigation, the Vatican is literally a foreign land. The phone rings again. This time it is Aurelia. Their conversation is stilted. She rings off before Scamarcio can smooth things over. When the pathologist finds signs of poison in the “suicide's” corpse, the corpse disappears and later its identity is revealed to be that of an ex-CIA man – Scamarcio and his police team are hemmed in by powerful interested parties. Aurelia is drawn into the dangerous game and Scamarcio is forced to turn to his father's Mafia contacts for help. Nadia Dalbuono's second thriller featuring Rome detective Leone Scamarcio (a third is in the pipeline) is as much a conspiracy thriller as a detective story. 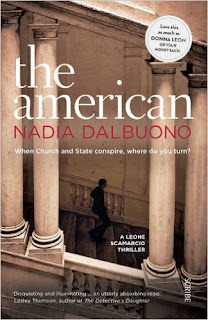 Having worked as a documentary director for channel Four and ITV, Dalbuono says that she now enjoys the freedom of novel writing and relishes “being able to create my own dialogue after so many years working with the thoughts of others.” But the book's blurb linking it to the work of Donna Leon, I think, does THE AMERICAN no favours. It certainly set me up with false assumptions. Dalbuono's writing style does not particularly echo that of Leon's. There is the concern for the current “state of the nation” that is echoed in much good crime fiction from Europe but on the whole the tone and dialogue is as much that of a pacey trans-Atlantic-thriller as of an Italian crime novel. No meals are lovingly described in this book. Don't let me leave you thinking I did not enjoy this book. I did. THE AMERICAN has a narrative which moves between Scamarcio's investigations in present day Rome and the voice of Carter, the dead American, whose memories stretch back over the last thirty five years or so. It also takes Scamarcio to the United States in his determination to solve the puzzle of the hanging man. But its strength lies in Scamarcio himself and his mounting dilemma as the son of a Mafioso with one foot in the protective camp of his father's old “lieutenant” and the other in his desired ambition to be an honest Roman cop. This strand alone should be enough to get you reaching for the next title in the series.